Americans are pampered, sheltered and oblivious to the rest of the world - more or less. One side effect of recent world turmoil has been undoubtedly been an improvement in the geographical knowledge of the average American. John Q Public now has at least a general idea where Afghanistan, Iraq and Libya are located. There must be better ways for us to learn about other countries, their history and customs. In a similar vein, most of us know about Western holidays and little of those celebrated in the East. But even that knowledge is often limited. Halloween is Trick-or-Treat Day, Christmas is now Gift-giving Day, and Independence is the 4th of July. We all know a bit about Easter, at least the common churchy side. How many people have even heard of Wesak? Easter is outwardly about the death and resurrection of Jesus Christ. But, what about other layers of meaning? Wesak is an annual holiday celebrated in many Buddhist countries in Southeast Asia. It is sometimes called “Buddha’s Birthday,” but also commemorates the enlightenment and death (parinirvana) of Gautama. The Real Wesak Festival is a multi-dimensional coming together of peoples from very far and wide. The story goes that at the time of the full moon of Taurus (usually in May) pilgrims gather in an isolated high valley on the far side of Tibet. The participants form ranks according to their inner station in life (they intuitively know their place) behind the most advanced of humankind. As the moment of the full moon approaches, the Elder Ones perform ritualistic movements and create symbolic patterns - triangles, stars, etc. - while chanting sacred mantrams. The Christ - representative of the West - leads the group as a whole and intones the last message given by the Buddha ages ago. At the exact instant of the full moon, a point of light is seen glowing in the distance. It eventually expands and moves closer to the waiting group until a great Being of Light is seen hovering above. 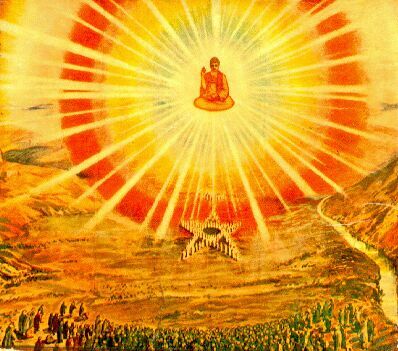 The Being is the Buddha returned. The crowd falls forward into prayer and acceptance of the gift about to given. The Great One pours out his blessing upon the assembly in many ways. One of which is to energize a giant crystal bowl of water placed at the head of the formation. When His visit and blessing is complete (requiring but a few minutes in total), he goes back to His high place of residence until his next appearance. Those in attendance fill their cups and drink in the blessed water, being renewed physically and spiritually for another year of service, growth and change. We all can participate in the ceremony by taking a moment or moments to link up energetically and spiritually with those Great Ones who are trying to bridge the gap between East and West, the inner and outer worlds. The Wesak Full Moon occurs this year on the morning of May 17, 2011. The exact time of our connection is apparently not critical. For more information, do an internet search on Wesak Full Moon. You may learn some things of interest and value.